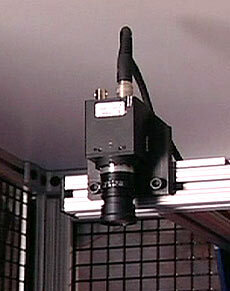 Vision Guided Robot | Automatic Fastener Feeding & Driving from Visumatic. Application: Automatically identifies, locates, registers and drives in multiple locations, and variable part orientations. Vision Guided systems with X-Y Robot represent the best of automated assembly technology, and can be programmed to meet virtually any customer need. 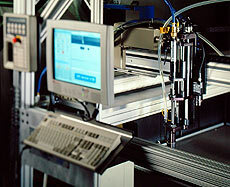 Robots allow full automation of the fastening application. After the screw is fed into the nosepiece, the entire jaw nosepiece assembly can be extended to the driving position to mechanically hold the screw at the lowest point over the hole prior to driving. This is the very highest assurance for a quality, no-mar cycle. Vision Guided. Extremely Accurate. Extended Bit. 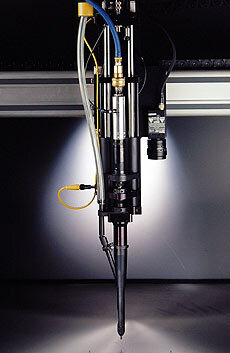 Automatic screw feeding and driving SCARA robot. Vision guided robot options to detect drive location and part inspection options to fully qualify components in automated assembly.